Yoga Mantras are sounds or words, often repeated, to help concentration during meditation. Derived from ancient Hinduism, a mantra can be anything from a basic noise to Sanskrit words that are traditionally thought to have spiritual powers. Mantras have been around as far back as 3000 years. They are said to help induce concentration as well as altered states of consciousness. Often they are melodic, having a hypnotic quality, which helps practitioners reach different levels of awareness. There are many mantras, full songs, those formed with a single sound, or just five syllables. An example of a simple mantra is “Om Namah Shivaya”, this is the salutation to Shiva the God of Destruction, which is said to have purifying effects on the body when recited. The Gayatri Mantra is said to be extremely powerful in leading us to self-realization and hence is often used by yogis during meditation practice. Of course the most famous mantra, is the sound Aum or Om. You may have used this many times during yoga practice. Aum is said to be the most basic sound of the universe, it is the vibration of the universe. The Om symbol is synonymous with yoga and Hinduism although many yogis maintain it is a sound without religion. Om is a symbol of pure spirituality and encompasses all existing sounds past, present and future. “I thank the universe for all the abundance it gives me”. “I am exactly where I need to be”. “My body is supple and flexible, I take good care of my body”. These modern mantras may be used to set an intention before yoga practice or could be used during meditation, as a point of focus for the mind. By consistent repetition it is believed that affirmations can manifest in our physical reality. 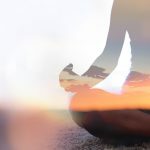 Mantras may be considered slightly ‘woo woo’ to someone new to yoga and meditation, but they are a key component of yoga, allowing for a deeper more connected and spiritual practice.